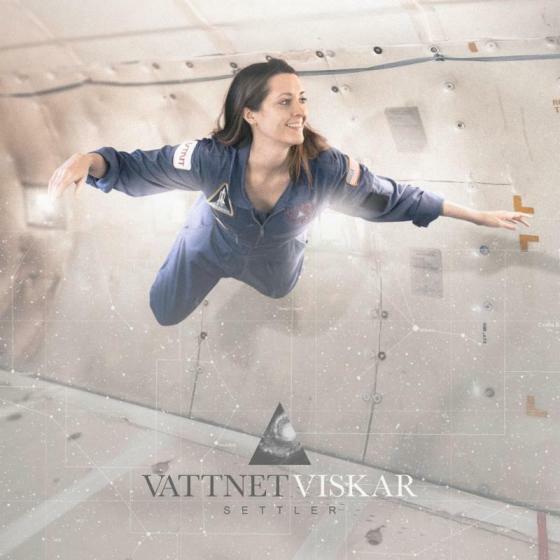 New Hampshire’s own Vattnet Viskar have returned with their follow up to their amazing debut “Sky Swallower,” the equally challenging and rewarding “Settler.” The first thing I noticed about the album was the artwork which has a model depicting the late Christa McAuliffe (also from New Hampshire) weightless and training to be an Astronaut. McAuliffe died in the Space Shuttle Challenger explosion. It is interesting how such a seemingly happy photo was a precursor to tragedy. That was by design according the the band. But what about the music? Vattnet Viskar are a black metal band with a greater focus on dynamics than most bands of that genre. Dynamics was the main reason I loved “Sky Swallower” and on “Settler” the dynamics are greater. The utter harshness of the lead track sets the tone but while many bands would just maintain that breakneck pace, Vattnet Viskar change things around. “Yearn” has one of the best riffs on “Settler” and it is a considerably slower track. This change in the pace and overall dynamics allows the song “Impact” to have an IMPACT. It start with a fierce yell which is all the more powerful because of the track before it. The overall performance of the band shows the tremendous chops and musicality of Vattnet Viskar. Most songs have many different riffs and parts, yet none of them overstay their welcome. “Heirs” is the closest to an “epic” and even that song flows so easily that it seems shorter than it is. I have found “Settler” to be an album that does grow with each listen. At first, I wasn’t exactly sure if I liked it! But that just means an album needs more time. With each listen, I would find another highlight (the opening riff on “Colony” for example!) and I liked the album more and more. If you liked “Sky Swallower,” “Settler” is the next step in the evolution of Vattnet Viskar. They are not changing but rather they are growing and just getting better at what they do. Hopefully, the band will get the attention and praise that has been afforded fellow American Black Metallers deafheaven. This band deserves it. This entry was posted in post metal, progressive metal and tagged black metal, music review, progressive metal. Bookmark the permalink.